Address : 333, 8th Ave. S.
It is difficult to go beyond1927, but Mr. Roger Barrière, one of the sons of Achille Barrière tells that he remembers that his father had already said to him that this magnificent domain belonged formerly to Mr. Déziel. This statement is confirmed by Mr. Rolland Goulet, age 88 whose father also had a business of milk situated near the Beauvoir Farm. 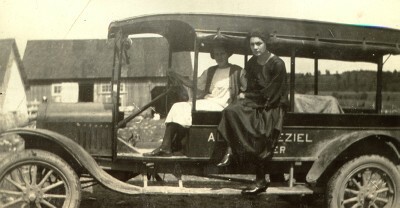 Mr. Goulet even supplied me a photo of the vehicle used by Mr. Alfred Déziel for his deliveries. but it surely is before 1927! 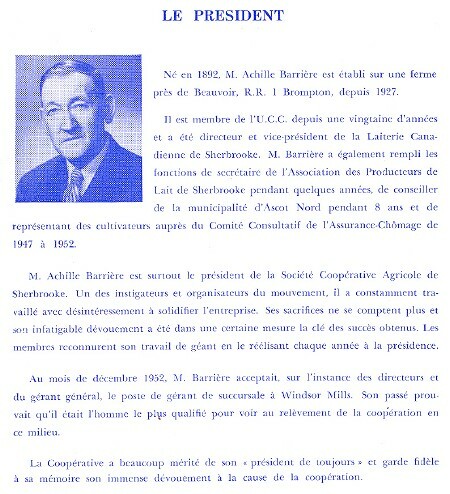 Mr. Roger Barrière says that in 1927, the farm was bought jointly by his father Achille, whose wife's name was Clara Berger, and his grandfather, Léon Berger, from Mr. Déziel. Berger and his son-in-law, Achilles Barrière. Before the enlarging of the barn. Beauvoir Farm, after the enlarging, not much time after it was bought. In the raspberry field, with the Chevrolet Van identified toLéon Berger. On the left, my father Achille, at the extreme right, my mother Clara Berger. 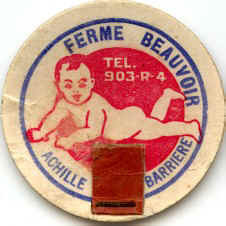 In 1945 or 48, my grandfather Léon sold his share in the business to his son-in-law, my father Achille. My grandfather was foreman for the Canadian Pacific and his health became staggering because of the Parkinson's disease. My father Achille had always worked in the business and it's by mutual agreement that this decision was taken. However, my grandparents always lived on the farm, until they passed away. In addition to the main site of the Beauvoir farm, three other sites belonged to it; approximately 400 acres of land all together. The herd was of approximately 40 cows, a reproductive registered bull, approximately 20 taures to ensure the relieving and 6 horses before the arrival of the tractor. 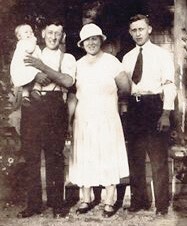 My parents, Achille and Clara, had five children, twin girls, Cécile and Pauline, both died of meningitis at 15 and 18 months, twin boys, Léon, deceased of the Spanish influenza in 1918, Léo, deceased in 1989 and myself, Roger, 14 years younger than Léo my brother! The baby! It's me, Roger. My father, Achille, is holding me in his arms. Then Clara, my mother and Léo my brother. grandfather Léon Berger, an uncle and my father Achille. of the Canadian Dairy (Co-op), which became Pinard Dairy. 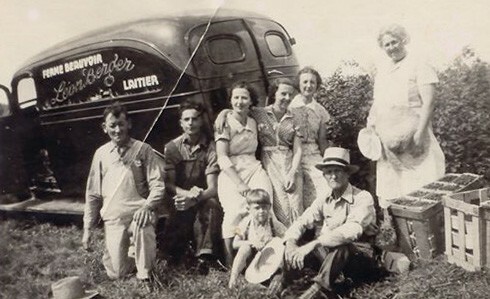 Until the pasteurization became obligatory, we always sold raw milk. In 1940, Léo took charge of the milk route. "I remember well the time when I was going to help Léo on the milk route", said Roger. The work on the farm was rather difficult. No electricity, we had to milk cows manually. The cooling of milk was made in cement vats, with ice that we were going to get with horses on the St-François river in winter time. The bottling also was done manually, from a vat with a tap. Things went much easier with the arrival of electricity in 1947. There were also the winter storms. We were going more than 5 kilometers away in sleigh with horses to make deliveries downtown Sherbrooke. It's thus following the obligation to pasteurize milk, "beginning of the Fifties", that my father sold the milk route to Léo which moved in Sherbrooke. 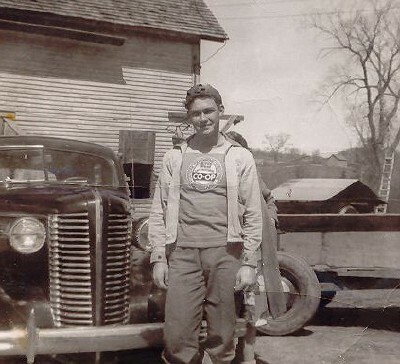 He worked on that milk route until 1960 and I continued to work on the farm with my father. From 1952 to 1958, my father had to work as manager at the Windsor Mills Co-op. 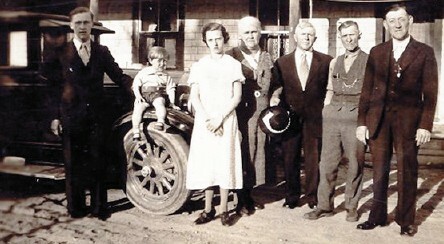 Being alone to do all the work on the farm, the task was very difficult, so we sold everything by auction in 1958.